Blog Engage allows you to submit your Blog Article(s) that will be placed in queue and promoted by our members to the front page. 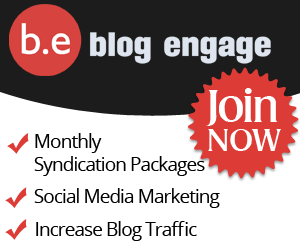 The ideal of Blog Engage is to promote interaction between bloggers by “Engaging” with each others blogs. Interaction that builds up quality comments and interactive discussions. Over the past year Blog Engage has added many unique features that has helped our community grow into what it is today. We have the ability to track and add status updates. Blog Engage allows members to add each other as friends. When you add a friend you can easily track their submissions and what are voting on. As you can see from the above picture I have added Blazingminds aka Karen as a friend. Behind the vote button you will see the little star/head indicating this this member is a friend f mine. I will always vote for these articles. We also allow our members to create groups allowing bloggers with similar interested to see each others articles. You can submit your blog to both the main site and a group during the submissions process. Blog Engage allows for easy access to submit stories to social networks. Under all articles you will see a share this link that will submit your blog article to your favorite social networks. The benefit is having all the options in one central location. When adding friends to your blog engage account you also have the ability to see all of your friends activities by visiting the status update section. You will see articles they have recently submitted or commented on. You will also see random status update messaged from friends and yourself. If you’re interested in joining our blog community please contact us with the requested information and we will be sure to send you an invitation. Our community is friendly and helpful. You will see we are unlike anything currently on the net regarding blog promotion.